RMK Kwikform systems ... used on Line Four to construct elevated stations and associated viaducts. 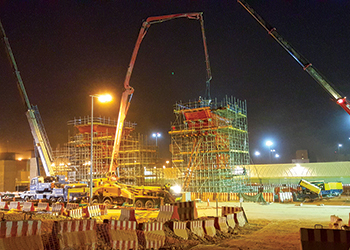 Formwork and shoring from RMD Kwikform is supporting three consortiums in building one of the largest subway developments in the world currently under way in Saudi Arabia’s capital Riyadh. The Riyadh Metro is one of Saudi Arabia’s largest infrastructure developments, and is undoubtedly the country’s most important public transport project spanning 176 km and having six lines. 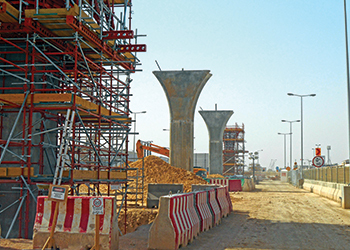 Three design-and-build consortiums are responsible for the project’s various lines: BACS is building lines One and Two; ArRiyadh New Mobility (ANM) is undertaking Line Three; and FAST is responsible for lines Four, Five and Six. “With a project of this scale, careful coordination, logistics and technical support are paramount between the consortiums and the companies providing them with temporary and permanent works solutions,” says a spokesman for RMD Kwikform. In addition to an extensive range of formwork and shoring delivered across multiple facets of this project, RMD Kwikform’s Saudi branches are also providing on-hand engineering expertise, and maintain a constant onsite presence. RMD Kwikform has provided FAST, ANM and BACS with a range of specialised steel and standard formwork systems for the construction of a total of 922 pier forms. Every one of the viaduct piers has to be cast in-situ and all range in size and height, from six to 18 m high, including complex double curvature and radius pier heads. The company has also employed dedicated site supervisors to be present across each consortium’s project area; their main role includes assisting with the safe erection and dismantling of equipment, and the best utilisation of the temporary works material. This has had significant benefits for the site teams, particularly when erecting or dismantling material and equipment; and with swift response times from RMD Kwikform, it has ensured the consistent safe and proper usage of all temporary works material supplied. The RMD Kwikform design office comprises 15 temporary works engineers, all on hand to support each design-and-build consortium; and with RMD Kwikform specialist engineers dedicated to each consortium to respond to the ever-changing needs on the project. Line One will run north to south through the centre of Riyadh. Covering more than 38 km long, the majority of this route will be underground and includes 22 stations and four transfer stations onto other lines. RMD Kwikform supplied a number of specialised formwork systems for multiple piers. “Due to the complexities and the shape of the pier stem and pier heads, we had to use a specially fabricated steel formwork system. Wherever each pier head radius varied in size, because of the curvature, the formwork was specially fabricated by RMD Kwikform using special formwork design and fabrication through our local fabrication partners,” says Moore. In addition to a combination of RMD Kwikform’s standard equipment, its special formwork systems provided the contractors cost-effective and time-saving solutions, he adds. 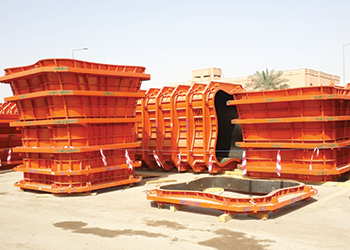 “This is where the versatility of standard off-the-shelf products, such as the Superslim Soldier system, plays an important part in the formwork supplied to the Riyadh Metro. The site team were able to reuse the equipment across a number of large piers and adapt the systems for the variety of pier sizes,” Moore explains. Line Two runs east to west across Riyadh and includes 13 stations and three transfer stations. Spanning more than 25 km, the line will be built mostly at-grade with some elevated sections. For the viaducts on this line, RMD Kwikform provided the same special formwork system that it provided for Line One. For the first tunnel on the west line, RMD Kwikform designed a solution to support the build of 10-m-high single-sided retaining walls and 3.5-m-high parapets. Utilising an extensive range of Superslim Soldier sections, and a specially-designed steel crank soldier system at the bottom of the wall to form a chamfer measuring 365 by 365 mm, RMD Kwikform also supplied cross beams and a plywood face to the shuttering. The system was then modified to create a jump-form system to facilitate the casting of wall sections above 10 m in height. The 1.8-m tunnel slab was then supported using a travelling soffit system comprising RMD Kwikform’s 80KN Rapidshor falsework system, and Superslim Soldiers as primary beams and secondary GTX timber beams. BACS favoured RMD Kwikform’s equipment along the tunnel walls, as the equipment could be reused as decking members for the slabs. This had significant cost saving implications and reduced the amount of equipment being delivered to site, Mostafa says. RMD Kwikform formwork systems help construct a total of 922 pier forms. On lines Four and Six, RMD Kwikform has provided a range of equipment to the FAST consortium to construct five elevated stations and associated viaducts. Each station has one central viaduct, each one measuring approximately 80 m long that will be constructed in three phases, cast in-situ on top of specially fabricated radius channel sections, designed and fabricated by RMD Kwikform. “We have designed and supplied a full shoring system using Rapidshor, and supplied the equipment in phased deliveries to adhere to the limited cranage use when unloading equipment,” says Hackett. The next major element is the concourse slab. Here, RMD Kwikform provided an economical design where the Rapidshor from the central viaduct will be used for the concourse. It has also provided extensions to the existing working platforms to allow for all post-tensioning works. Hackett says the final major element of each station will be the underground basements, measuring approximately 100 m long by 50 m wide. Located approximately 12 m below ground, they will be constructed in four phases: bottom slab, external walls, internal walls and roof slab. “RMD Kwikform has utilised its ‘off-the-shelf’ equipment, heavily utilising Superslim Soldiers and Alform Aluminium beams across the majority of this project. One of the main technical challenges here was to re-use the formwork as much as possible, and to try and reduce the amount of time and labour needed for re-assembling formwork multiple times,” says Hackett. Furthermore, RMD Kwikform also provided a mix of special steel pier formwork and standard shoring and access equipment to Line Six, for the construction of viaduct piers along 6 km of the elevated track. The piers range in height from 6 to 9 m, and each of the special formwork systems was designed, fabricated and delivered in Q1 2015, and has since then been in continuous use. RMD Kwikform’s Kwikstage scaffolding was also provided for re-bar fixing access and then for a fully enclosed working platform for all work at the pier crown. ANM is responsible for the design-and-build of Line Three, which is the longest line at 41.2 km. Line Three features 22 stations, including the main stations Qasr Al-Hokm and Western, 10.4 km of bored and mined tunnel and 26.7 km of viaduct with maintenance depots at the west and east extremities.